A New species of Waxcap Gliophorus reginae in Worcestershire. In 1998 our family moved into Willow Bank, a cottage at Bliss Gate about 3 miles west of Bewdley. Three acres of land came with the cottage, two of which are an interesting mix of unimproved meadow, bluebell copse, gorse scrub with heather, and a small stream. It soon became apparent that the grassland was good for waxcap fungi and I started to document what appeared where and when. Over the next few years, 21 species of waxcap, several Fairy Clubs and Earth Tongues, and a range of other associated grassland fungi had been identified with the help of several mycologist friends. But there was one particular waxcap that I could not identify. It had a viscid pinkish/purple cap and flexuose stipe flushed orange/pink (01 & 02). It looked to me like a variety of the Pink Waxcap Hygrocybe calyptriformis. I sent dried specimens off to the mycological department at Kew in 2000 (K(M)156265), and the reply came back that it was a variety of the Parrot Waxcap Hygrocybe psittacina. 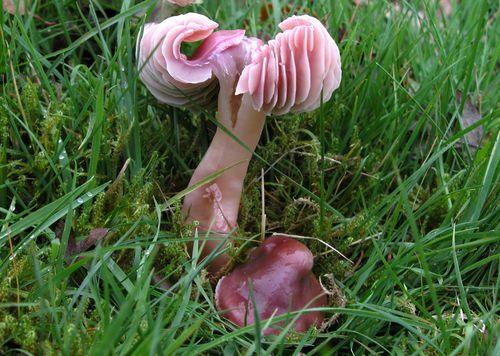 However, 2011 saw the start of the three-year DERFA-funded ‘Project Waxtongue’ involving mycologists at Kew and Aberystwyth University researching the taxonomy of species of waxcaps Hygrocybes and earth tongues Geoglossums in the United Kingdom and their feeding mechanisms. As part of this project, I submitted more dried collections of this unusual fungus that were received with interest and a request to see it in situ if it fruited again. A single toadstool appeared unusually early in October 2012, but was unfortunately broken off by the time I found it. Then we had to wait until January 2013 until the main flush of toadstools came up. To protect them from rabbit damage and frost, I caged them and covered them in bubble wrap until Dr. Martyn Ainsworth from Kew could visit (03). As a result of this DNA research project, the Willow Bank 2008 collection (K(M)156265) has become the holotype for a brand new species! It has been named Gliophorus reginae to commemorate the diamond jubilee of Her Majesty Queen Elizabeth II in 2012 and the 60th anniversary of her coronation in 2013. 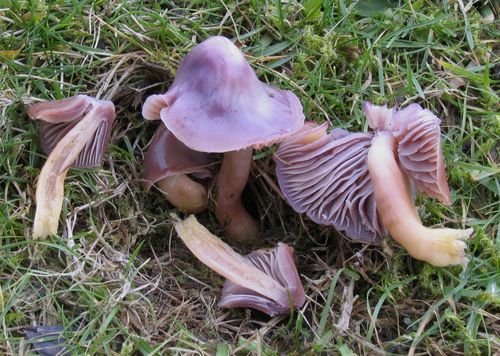 The published account of this work (in Issue seven of MycoKeys) is titled -"DNA barcoding and morphological studies reveal two new species of waxcap mushrooms (Hygrophoraceae) in Britain" A. Martyn Ainsworth, Paul F. Cannon, Bryn T. M. Dentiger. It can be found by following this link: http://www.pensoft.net/journals/mycokeys/article/5860/abstract/dna-barcoding-and-morphological-studies-reveal-two-new-species-of-waxcap-mushrooms-hygrophoraceae-in-britain, doi: 10.3897/mycokeys.7.5860. This species has appeared at Willow Bank in the following years: 2000, 2001, 2002, 2004, 2005, 2006, 2007, 2008, 2010, 2012, 2013. It seems to fruit later than other waxcaps and I have recorded it in November, December and January, with only one record of a single cap in October. The lateness of the fruiting period may mean that it has been overlooked in other waxcap-rich areas. 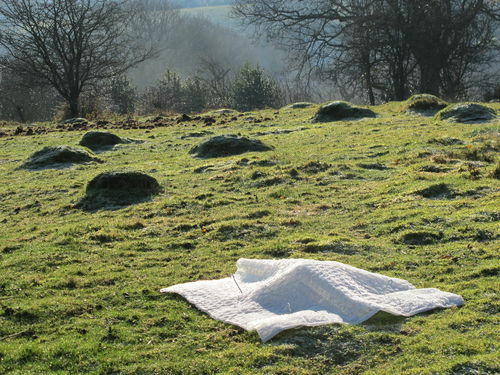 In addition to this single record in Worcestershire, it has been recorded from a cemetery in Pembrokeshire and fields in Staffordshire and Derbyshire. So it is worth checking likely places during the winter, and it might be found elsewhere in Worcestershire!